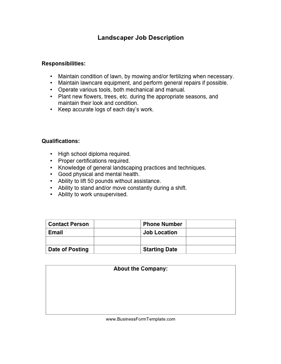 This landscaper job description can be used to make sure that all gardening, horticulture and landscaping employees understand their duties and responsibilities at work. Maintain condition of lawn, by mowing and/or fertilizing when necessary. Maintain lawncare equipment, and perform general repairs if possible. Operate various tools, both mechanical and manual. Plant new flowers, trees, etc. during the appropriate seasons, and maintain their look and condition. Keep accurate logs of each day's work. Knowledge of general landscaping practices and techniques.